Pearl R. Nye grew up on the Ohio and Erie Canal. 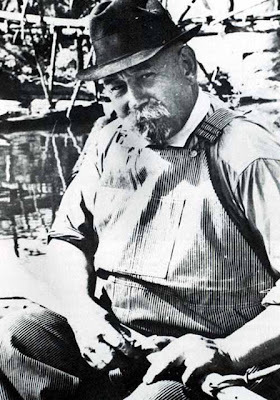 He was born on the canal boat Reform near Chillicothe, Ohio, on February 5, 1872.After the canal closed, Nye followed several pursuits including carpentry, writing, and singing at local establishments around Akron, Ohio. However, he never lost his love of the "Big Ditch," and worked hard to preserve the history and culture of the canal. In the 1930s Nye contacted local historical organizations and libraries about preserving his materials and collaborated with an author to write a book about his life on the canal.Nye was "discovered" by John A. Lomax who had heard about him from an Akron newspaper reporter. In June 1937 Lomax recorded 33 of Nye's songs, with commentary for the Library of Congress. In November of that year, Alan and Elizabeth Lomax recorded 39 more songs. In September 1938 Ivan Walton recorded three additional songs. All the recordings were made in Akron, Ohio, and are included in this online presentation.